Inshore Slams have been the norm over the last few weeks. An inshore slam is when you catch a snook, trout and redfish in the same day. 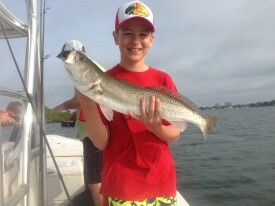 Fishing the flats, docks and oyster beds in St Pete Beach my charters have been catching all tree species. Live and cut bait has been working, but we seem to be catching more fish on the cut bait. In a few trips we caught all three in the same spot.